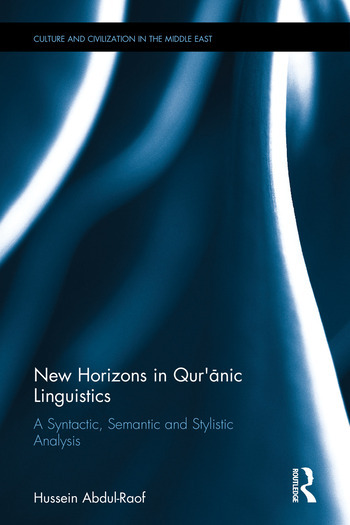 New Horizons in Qur'anic Linguistics provides a panoramic insight into the Qur'anic landscape fenced by innate syntactic, semantic and stylistic landmarks where context and meaning have closed ranks to impact morphological form in order to achieve variegated illocutionary forces. It provides a comprehensive account of the recurrent syntactic, stylistic, morphological, lexical, cultural, and phonological voids that are an iceberg looming in the horizon of Qur'anic genre. It is an invaluable resource for contrastive linguistics, translation studies, and corpus linguistics. Among the linguistic topics are: syntactic structures, ellipsis, synonymy, polysemy, semantic redundancy, incongruity, and contrastiveness, selection restriction rule, componential features, collocation, cyclical modification, foregrounding, backgrounding, pragmatic functions and categories of shift, pragmatic distinction between verbal and nominal sentences, morpho-semantic features of lexical items, context-sensitive word and phrase order, vowel points and phonetic variation. The value of European theoretical linguistics to the analysis of the Qur’anic text at a macro level has been overlooked in the academic literature to date and this book addresses this research gap, providing a key resource for students and scholars of linguistics and specifically working in Arabic or Qur’anic Studies.